You will find travel information, a bookstore/gift shop, a wildlife viewing platform, coffee and goodies, a raffle, and always-friendly, knowledgeable staff. Park in the main-picnic-area parking lot off the Island Highway at Finlayson Arm Road. Hiking trails in the park take you from valley floor to ridges, even to the top of Mt. Finlayson. Enjoy two different waterfalls, an abandoned gold mine, and incredible views. Don't miss one of the largest concentrations of Bald Eagles anywhere in Canada feasting on the spawned-out salmon carcasses from December to February. Watch for the up-coming Eagle Extravaganza Programs! The lure of towering trees and a lush temperate rainforest isn't the only reason droves of tourists flock to Goldstream Provincial Park each fall. A creek bed lined with hundreds of rotting salmon carcasses also pulls in a crowd. Goldstream Park offers front row seats to one of nature's greatest spectacles - the annual salmon run. A walk along the interpretive trail allows visitors to bear witness to the mystery of a salmon's life cycle. 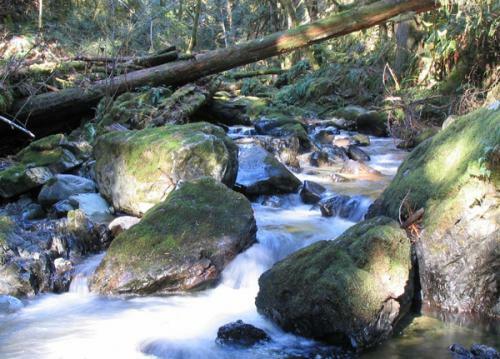 Thousands of Chum, Coho and Chinook make the epic journey up Finlayson Arm, into Goldstream, to the place where they hatched four years earlier. Undaunted by rapids, logs jams and waterfalls, their bodies become battered and scarred in the process. After spawning, the salmon die shortly after. But the cycle doesn't end there. Hundreds of eagles, perched on coniferous branches, come to Goldstream Park to stake out lunch. Bears gorge on their last meals before hibernating for the winter. Tiny salmon fry emerge from beneath the rocky streambed to feed before their departure to the sea. The salmon's rite of death ritual is happening at Goldstream Park now through December. "The numbers of salmon returning are moderate this year," said naturalist Adam Taylor. Hatchery biologists expect 30,000 Chum to return this year, with the majority arriving in November. Taylor attributes the lower than average numbers due to a lack of rain. "Salmon use rain as a cue to come upstream," he said. Just as the salmon return every four years, so too has the free salmon education program for school children. "We are absolutely thrilled to have our programs back," said Taylor. After the provincial government cut funding for educational programs at Goldstream Park's nature house several years ago, the number of participants in school programs dropped from approximately 300 classes a year to 100, Taylor said. Local businesses were encouraged to donate funds in order to offset the cost of running the program. After four tumultuous years for the nature house, the Goldstream Chums program has garnered enough corporate sponsorship to make the program free again. In addition to the programs for schools, the nature house continues to offer a variety of activities for the whole family each weekend. 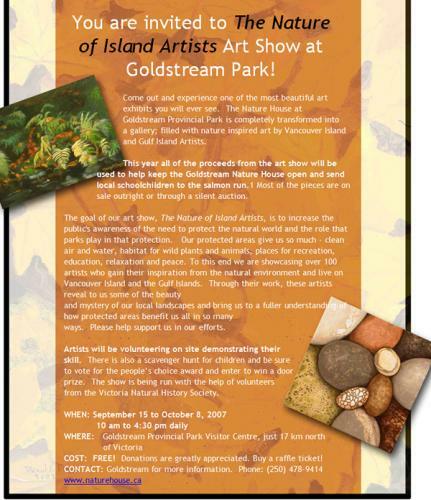 Goldstream Park is currently recruiting volunteers to help staff the Nature House and patrol the stream during the salmon run. Volunteers would work three to four hour shifts once per week. Weekend help is especially needed. Contact Adam or Carol at 478-9414 for more information. 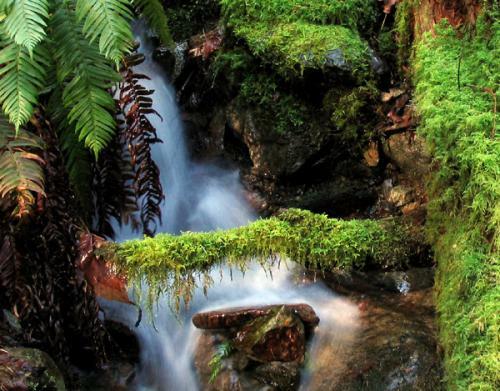 Goldstream Provincial Park is growing considerably, thanks to a land swap announced by the B.C. government last week. Water, Land and Air Protection Minister Bill Barisoff made the announcement Wednesday, part of 150,000 hectares in total added to the parks system province-wide. At Goldstream, a land swap with Western Forest Products puts 10 hectares at the base of Mount. Finlayson within Goldstream Park's boundaries, in exchange for a gravel pit in Saltair, near Ladysmith. The park is also extend to cover an additional 88 hectares of Crown land. Staff at Goldstream Park Nature House said Monday the news came as a surprise to them. While not involved with the parkland addition, Land Conservancy spokesperson Alison Spriggs said the news was definitely good.
" It sounds like this is good news," she said. "Anything that adds more parkland in B.C. is a good thing." The new land will provide a buffer between the Bear Mountain development and the park, a Ministry spokesperson told the News Gazette. The new parkland will also provide an area with a trail to the top of Mount Finlayson from the north. The park was created in 1958 when the Victoria Water Board gave the land to the province. With the additional acreage, the park area has grown to more than 475 hectares. Additional lands were also designated in '94 and '96, through the Commonwealth Nature Legacy and Crown land acquisitions.